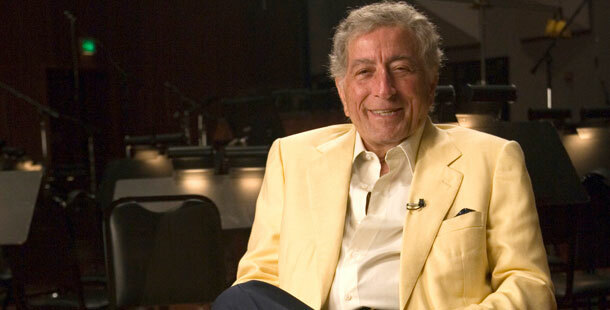 The son of a grocer and an Italian-born immigrant, Tony Bennett is born Anthony Dominick Benedetto on August 3. Already attracting notice as a singer, Bennett performs beside Mayor Fiorello La Guardia at the opening of the Triborough Bridge. Serves in combat in Europe during World War II and, upon his return stateside, attends the American Theater Wing on the GI Bill. Successfully auditions for Columbia Records’ producer Mitch Miller, singing “Boulevard of Broken Dreams,” and signs with the label. Scores his first hit, “Because of You,” which peaks at No. 1 and remains on the charts for 32 weeks. His next single, Hank Williams’ “Cold, Cold Heart,” becomes the first notable cover of a country tune. Both feature the Percy Faith Orchestra, which provides the lush backdrop of 24 Top 40 tunes he charts before 1964. Scores four hits in the Top Five of the charts. Performs for the first of nine U.S. presidents, Dwight Eisenhower. The experimental album The Beat of My Heart highlights jazz percussionists as its only instrumentation and serves as a precursor to later distinguished works. “Firefly,” by new songwriting team of Cy Coleman and Carolyn Leigh, becomes Bennett’s last hit of the ’50s. Basie Swings, Bennett Sings serves as a blueprint for his later forays into jazz singing. Records his first Grammy Award winner – and his subsequent trademark tune – “I Left My Heart in San Francisco.” Released as a single by Columbia, it remains on national charts for nine months. When the song’s album is released, it goes gold. The song was written by then-unknown songwriters George Cory and Douglass Cross. Sells out New York’s Carnegie Hall, becoming the first male pop solo performer at the famed venue. As a follow-up, Columbia releases the live album, Tony Bennett at Carnegie Hall. Performs for the Queen of England in the first of six Royal Command Performances. Scores a string of aesthetic and popular triumphs with his albums consistently hitting the top of charts, including 1964’s When Lights Are Low, his tribute to the King Cole Trio and 1966’s The Movie Song Album. Enjoys a series of charting singles, such as the Top 40 hits “Who Can I Turn to (When Nobody Needs Me)” from the 1964 Broadway musical The Roar of the Greasepaint, the Smell of the Crowd and “If I Ruled the World” from the 1965 Broadway musical Pickwick. Joins friend and colleague Harry Belafonte to march with Martin Luther King Jr. in Selma, Alabama. Snowfall: The Tony Bennett Christmas Album – which stands as his only solo yuletide release for nearly 35 years – gives audiences such classics for the holidays as “Winter Wonderland,” “White Christmas” and “My Favorite Things.” Robert Farnon arranges the music and conducts the orchestra for the project. Changes labels from Columbia to MGM Records and, by the mid-1970s, decides to form his own record company, Improv. Makes several albums for Improv, including two critically-acclaimed duet records with jazz pianist Bill Evans in 1975 and 1977. Son Danny, who becomes his manager, begins forging the next stage of his pop icon father’s career, which yields a new era that brings an overwhelming affinity from the next generation of audiences. Touring regularly in concert halls around the world, Bennett finds a growing appreciation for traditional pop music as performers like Natalie Cole and Linda Ronstadt record albums of standards. In this new environment, Bennett re-signs with Columbia records and releases The Art of Excellence, his first chart album in 14 years. The first celebrity guest artist to “appear” as himself in the animated hit The Simpsons – in the episode entitled Dancin’ Homer- Bennett starts to break ground with a younger set of fans. Having consistently garnered excellent reviews in venues such as the Hollywood Bowl and Radio City, Bennett celebrates 40 years in the business with a concert at London’s Prince Edward Theatre. 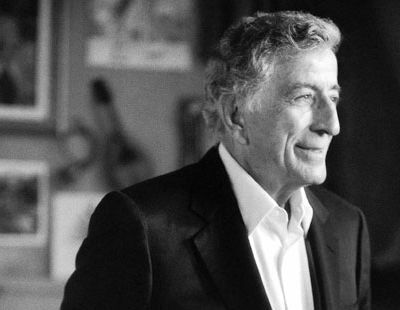 Columbia/Legacy’s Forty Years: The Artistry of Tony Bennett is released as a four-CD set. Delivers a show-stopping performance of “When Do the Bells Ring for Me” from his Astoria album at the Grammy Awards. His album Perfectly Frank – a sampling of Bennett’s take on an array of Frank Sinatra songs – starts the Bennett revival in earnest and earns him a Grammy Award. Appropriately enough, Sinatra himself has called Bennett his favorite singer. Bennett’s tribute to Fred Astaire, Steppin’ Out, goes gold, and he wins another Grammy Award for Best Traditional Pop Vocal Performance. The video is included in MTV’s popular program Buzz Bin and he is nominated for an MTV Video Music Award. Presenting with the Red Hot Chili Peppers – alongside Anthony Kiedis and Flea – at the MTV Music Video Awards cements Bennett’s reputation as the epitome of cool. The Red Hot Chili Peppers are just one of the alternative rockers who will cite Bennett’s influence on their music. Further bringing Bennett to the forefront of the next generation’s hip idea of music, his MTV Unplugged – featuring guest stars Elvis Costello (“They Can’t Take That Away from Me”) and k.d. lang (“Moonglow”) – goes platinum and wins the Grammy Award for Album of the Year. Rizzoli International Publications publishes What My Heart Has Seen, a collection of Bennett’s paintings that features portraits he has created of some of his idols, including Sinatra, Ella Fitzgerald and Duke Ellington, and landscapes of his world travels. On Valentine’s Day, A&E airs Live by Request: Tony Bennett and garners Bennett an Emmy and Cable Ace Award. The program’s concept, developed by Bennett himself, is so popular that the network creates a continuing series of Live by Request music specials. Earns a Grammy Award for Bennett on Holiday: A Tribute to Billie Holiday. His best-selling autobiography, The Good Life, hits bookstores. Releases a children’s album, The Playground. Wins another Grammy for his tribute to friend and colleague, Duke Ellington, Bennett Sings Ellington: Hot and Cool. Makes a cameo appearance in the hit film Analyze This, starring Robert De Niro and Billy Crystal. Releases on Columbia Records Playin’ With My Friends: Bennett Sings the Blues, an album of duets with the likes of Bonnie Raitt, Billy Joel and Stevie Wonder, featuring such tunes as “Stormy Weather” with Natalie Cole and “Let the Good Times Roll” with B.B. King. Receives a Grammy Lifetime Achievement Award. Celebrates his 75th birthday with a gala event at Metropolitan Museum of Art. The city of New York opens the Frank Sinatra School of the Arts high school in Queens, which Bennett conceived of and championed. The American Society of Composers, Authors and Publishers honors Bennett with the Pied Piper Lifetime Achievement Award. Receives a Grammy Award for Playin’ With My Friends. With son Dae, open Bennett Studios in Englewood, N.J. as a full-service, state of the art production and recording facility. With k.d. lang, records a duets album at Bennett Studios, A Wonderful World, which is produced by T-Bone Burnett. PBS airs the performance special, Tony Bennett’s Wonderful World: Live in San Francisco. Makes cameo appearance in the film, Bruce Almighty, starring Jim Carrey and Jennifer Aniston. Along with k.d. lang, wins a Grammy for A Wonderful World. Returns to Bennett Studios to record The Art of Romance, which features the track, “All for You,” with lyrics penned by Bennett himself. Original oil painting, Central Park, is accepted into the permanent collection of the Smithsonian Museum of American Art in Washington, D.C.
Named 2006 NEA Jazz Master. Wins Grammy Award for The Art of Romance. In celebration of his 80th birthday, Tony Bennett Duets: An American Classic is released and becomes the highest charting and best selling CD of his career, reaching platinum status in less than three months. NBC airs Tony Bennett: An American Classic, a groundbreaking musical variety special directed by Oscar winner Rob Marshall. Receives the Billboard Century Award. Honored by the United Nations with their 2007 Humanitarian Award.